Energy Dynamics: TASC - Ahana Koko Lele - Shame on You! TASC - Ahana Koko Lele - Shame on You! 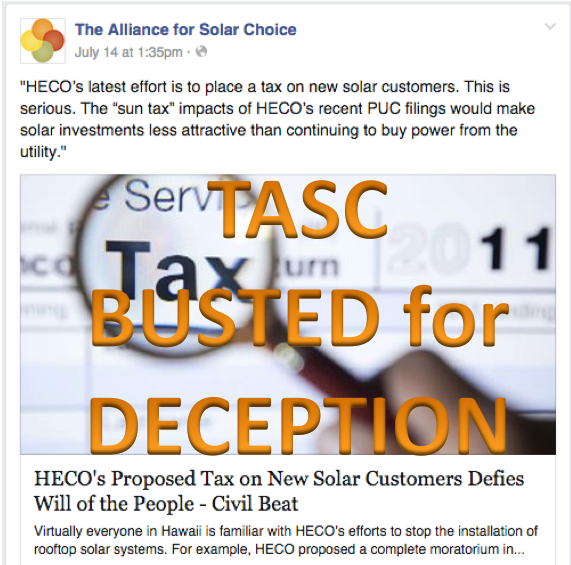 The Alliance for Solar Choice's taxing the sun campaign is not just hyperbole, it's downright deception and TASC should be publicly called on the carpet for it. To Robert Harris, the Hawaii Public Policy Director for Sunrun, who is heading up this campaign in Hawaii, Ahana Koko Lele - Shame on You! Here's the scoop. The tax opinion that TASC is citing as authoritative is based on an interpretation of Feed In Tariff (FiT), not Net Energy Metering (NEM) or Value of Solar (VOS) or HECO's Grid Supply Tariff. These programs are typically described as the exchange of electricity between the customer and the utility, where the customer has the ability to "bank" the excess electricity the rooftop PV system produces. The utility's system acts as the customer's storage bank so the customer can "withdraw" electricity when the PV system is not producing. On the other hand, FiT programs are more akin to a power purchase agreement, where the specific purpose of the PV system's contract or tariff is to sell power to a utility. Therefore, if the purpose is to sell a commodity or a service it would be logical that the revenue generated for the producer would be taxed. That is the finding of tax opinion that TASC circulated - it has nothing to do with NEM or VOS or HECO's Grid Supply Tariff's exchange of electricity. In transitioning away from a NEM tariff, the objective is to find the right value of that electricity exchange. Electricity being generated from rooftop PV systems during a period of peak demand has more value to the elecctric system. But, when rooftop PV systems generate when there is low demand the excess electricity forces the electric system to operate uneconomically to balance the system to ensure reliability. Another Ahana Koko Lele to Robert Harris, again, and Jon Yoshimura, Director of Policy and Electricity Markets for SolarCity. They submitted a joint letter to the Hawaii Public Utility Commission as "public comment" about HECO's grid-supply tariff. How disingenuous as both companies are represented as intervenors through the organization their companies founded, The Alliance for Solar Choice (TASC). Moreover, they want to transfer all the risk to the non-PV ratepayer for the PV rooftop systems their companies sell by seeking a long-term pricing scheme (looks more like a power purchase agreement to me) so they can get their projects financed by guaranteeing their investors a steady revenue stream. Sunrun and SolarCity's third party ownership business model is looking more like it's built like a house of cards and on the backs of the non-PV ratepayer. Talk about self-serving - again, Ahana Koko Lele!